​ LUBBOCK – With 30,759 undergraduate students, Texas Tech's student body has reached more than 30,000 undergraduates for the first time, according to a Tech news release. 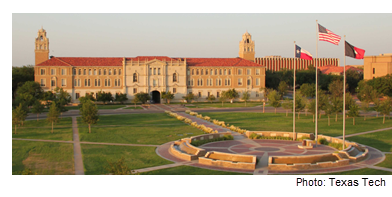 Tech's total enrollment of 37,010 students also set a new record for the fall 2017 semester. Tech's undergraduate student body is 27.8 percent Hispanic and meets the enrollment criteria to be recognized as a Hispanic-Serving Institution by the United States Department of Education, according to the release. A university or college must have at least 25 percent Hispanic enrollment to qualify as a Hispanic-Serving Intuition. This semester, Hispanic enrollment for first-time freshmen accounts for 38.8 percent of this year's freshman class, as well as 8,515 undergraduate Hispanic students compared to 7,278 in 2016. Also this year's freshman class also set a new record with 5,885 students. See more education stories across Texas here.